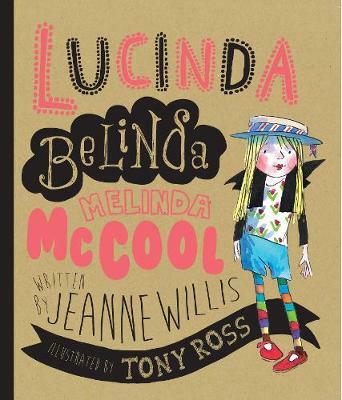 The most beautiful girl in the whole of the school is Lucinda Belinda Melinda McCool - but Lucinda Belinda felt it was her duty to guide all her friends in the subject of beauty. Lucinda becomes the scourge of family and friends, criticising big bottoms and moustaches (especially... read full description below. The most beautiful girl in the whole of the school is Lucinda Belinda Melinda McCool - but Lucinda Belinda felt it was her duty to guide all her friends in the subject of beauty. Lucinda becomes the scourge of family and friends, criticising big bottoms and moustaches (especially her grandma's) until everyone avoids her. So when Lucinda meets a monster in the forest, she makes it her mission to make-over this scary creature. 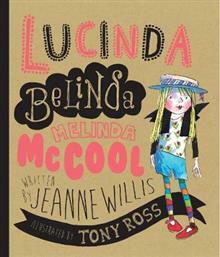 Unfortunately changing its outside does not change what's inside - as Lucinda Belinda discovers! Jeanne Willis (Author) Jeanne Willis is an award-winning children's author and scriptwriter. She had her first picture book published by Andersen Press at the age of 21, and since then she has won the Silver Medal Smarties Prize (Tadpole's Promise), the Nasen Special Needs Award (Susan Laughs), the Sheffield Children's Book Award (Who's in The Loo) and the Red House Children's Book Award (Bottoms Up). Jeanne has also worked on scripts for TV, including Polly Pocket and The Slow Norris, and a pilot TV series for Dr Xargle. She lives in North London with her husband. Tony Ross (Illustrator) Tony Ross has been illustrating books for over 40 years, and has been published all over the world. He is perhaps best known for his much-loved Little Princess series, which has been adapted for TV and is currently showing on Channel 5s Milkshake, and for his collaboration on David Walliams' best-selling children's books. Tony's books have been shortlisted for the The Laugh Out Loud Book Awards (Slug Needs a Hug) and the Kate Greenaway (Dr Xargle's Book of Earth Tiggers), and Tadpole's Promise won the Silver Medal Smarties Prize. He has been named as the best-selling illustrator in the UK for three years in a row, and he is the UK's libraries' most-borrwed illustrator. He lives in Rutland.